UPPER EAST SIDE, NY — Officials christened New York City's newest line in the city's expanding ferry service Wednesday. The new Soundview line extends the nautical transit service to the Bronx and the Upper East Side. Upper East Siders can now board the ferry at the East 90th Street ferry landing and take it up to the Bronx or down to Lower Manhattan, city officials said. The Soundview line is the only currently-planned route that will service the Upper East Side pier. City officials hailed the new route as a win for residents of the Bronx and Upper East Side, who now have and additional way to get around the city. "The Upper East Side is thrilled to finally have our very own NYC Ferry stop along the Soundview route," City Councilman Ben Kallos said in a statement. "NYC Ferry continues to connect New Yorkers to our waterfront while reducing the burden on our City's public transportation system while helping New Yorkers get from A to B quicker, easier and more enjoyably." Transit options for Upper East Siders have dramatically improved since the beginning of 2017 with the opening of the Second Avenue Subway and now with the launch of the East 90th Street ferry. Neighborhood residents living closer to the East River were previously forced to bet on the city's often-unreliable bus service or walk all the way to the Lexington Avenue line for the subway. The four-stop Soundview route is expected to take 45 minutes from end to end. The four stops on the route are Soundview, East 90th Street, East 34th Street and Wall Street/Pier 11, city officials said. The New York City Ferry's fare is $2.75, the same cost as a subway swipe. The new ferry line will also make connecting with the rest of the ferry system simple. 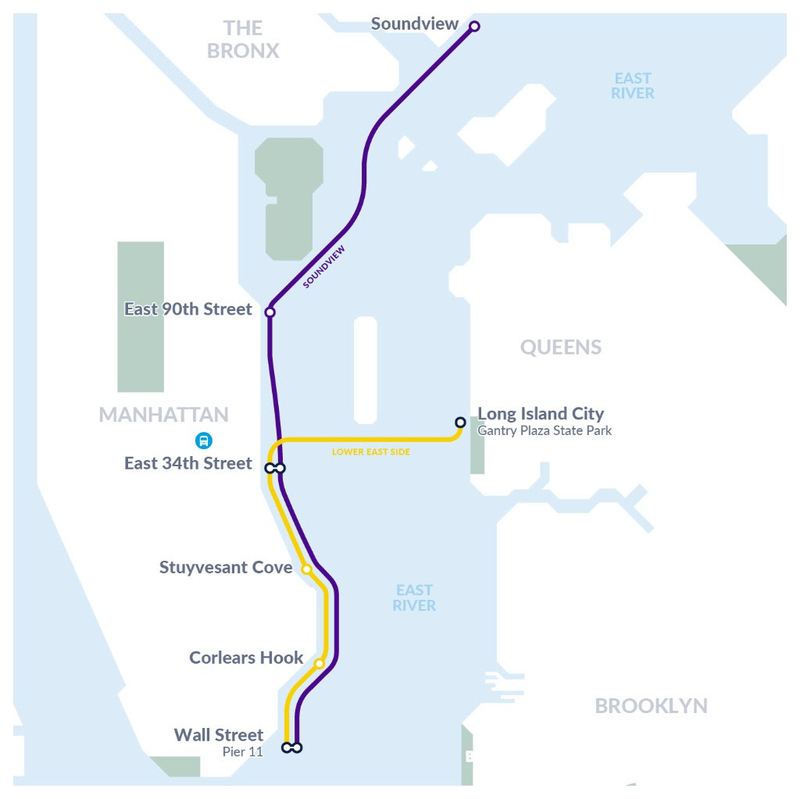 With stops at both East 34th Street and Wall Street, the Soundview route features connections with every other current route, including ferrys to Governor's Island. "Too often we forget that New York City is an island metropolis. A citywide ferry network connects our various harbor-oriented communities and creates a more accessible City for all," Community Board 8 Chair Alida Camp said in a statement. 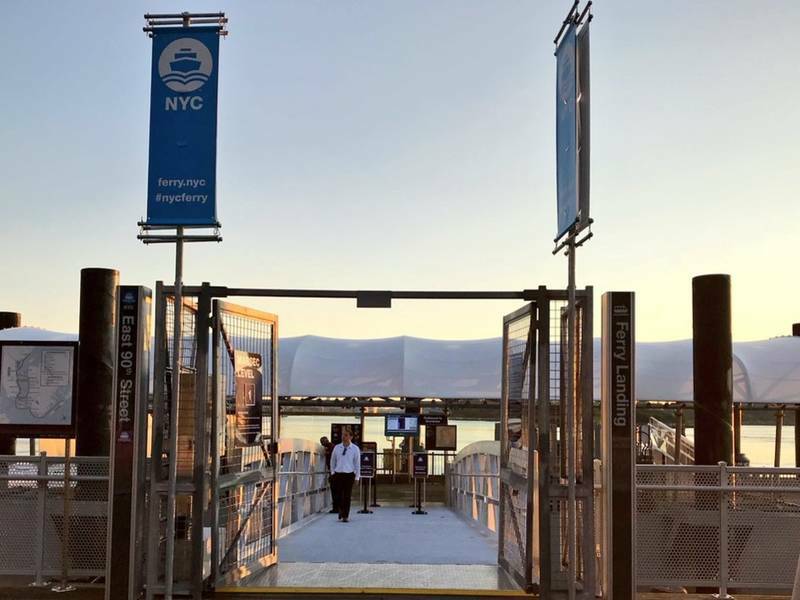 "Manhattan Community Board 8 is thrilled to celebrate the opening of the Soundview Ferry Route, which includes a stop at 90th Street Pier on the Upper East Side." Image of map courtesy New York City Economic Development Corporation.